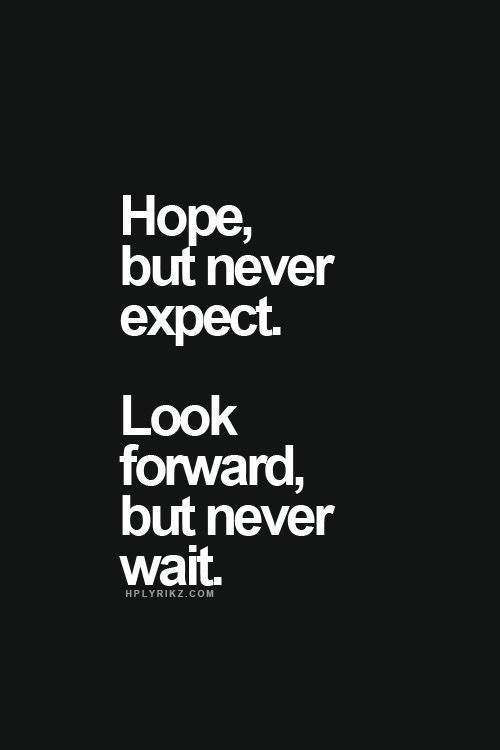 Hope, but never expect. Look forward, but never wait. Hope is a powerful thing. It is sometimes the only motivation for pushing through challenges and hardship. However, it can also be destructive especially when it crosses over to expectation. Looking forward is a power thing. Like hope, it motivates to get through things. Looking forward opens your mind to possibilities. It gets you excited about the future. Yet, more often than not we play the waiting game because we want to share this excitement with others. However, excitement dims when we wait too long to move forward. This quote strikes a balance and reminds you of that balance.